Danai led them through the halls to a large room she called a cafeteria. There were myriad tables and benches, all laid out neatly in rows, and a vast counter at one end with glass over it. It was completely empty. Danai shut the door and let Maha unclip Mhumhi’s collar, giving him free reign of the place. He shook himself gratefully, glad to be rid of the hateful pressure it had been put on his neck. He jumped onto the nearest table, sniffing curiously- it did indeed smell heavily of food in here, though he couldn’t see any of it anywhere. The table was sticky, and on the plastic there were faint, sweet-smelling stains. He licked at them, then moved in, sniffing eagerly. Maha scrambled up after him on her hands and knees to rub the spot he had licked with her finger and bring it to her mouth. Danai made a soft noise, clearing her throat, and Mhumhi looked over at her. Mhumhi caught her tone, and jumped down obediently. Maha scowled and stayed where she was, her finger still in her mouth. Maha gave a kind of dismissive grunt, but she slid back down to sit on the bench. She glanced over at Danai, who was busying herself at the far-off counter, and lowered her voice. Mhumhi tilted his head a little; the thought had occurred to him, but he had never been quite sure how to present it to Danai as a question. “I don’t know,” he said. “I saw where they keep them, though, and it isn’t pretty.” Danai had said the hyenas were their brothers and sisters, but cages were pretty poor places to keep your siblings. “Don’t worry about Kutta, she can take care of herself,” Mhumhi said. “She’ll find somewhere to lie low… recuperate and wait for us…” He hoped that was what she was doing, anyway. It was hard to think about. “Oh,” said Mhumhi. He hadn’t spared a thought for the domestic ever since they’d left him spouting off in the midst of the foxes. “He’ll be fine if he makes it back to his hulker, I guess.” He wasn’t going to waste time worrying aboutBiscuit, anyway. “Kutta told the little dogs that they could kill him,” Maha pointed out. Mhumhi looked up quickly at her face, then put his forepaws on the bench so he could lick it. “Like I said, he wasn’t really our friend,” he told her, voice firm. Maha rubbed her nose and then patted his head. There was the noise of someone clearing their throat. Danai had returned, bearing a pair of plastic trays. She slid them now onto the table side-by-side, making Maha pull her elbows away. In answer, Mhumhi hopped up onto the bench and sat on his haunches beside Maha, putting one paw on the table to steady himself. Maha said nothing, still being stubborn, but couldn’t seem to hide the interested expression on her face. Danai leaned over to arrange the plates on the trays in front of them. Before Mhumhi she put a large slab of something grayish that smelled salty; in front of Maha she put a smaller slab of the same and a bowl of some yellow things sitting in a viscous fluid. Mhumhi supposed it was the fruit, because it did smell blindingly sweet. Maha pulled hers up to her mouth and took a wary bite. “It’s tough,” she complained, pulling back and smacking her lips. Her eyebrows raised. Mhumhi sniffed at his, then licked it. He saw the meaning for her expression. It really didn’t taste quite like meat, but it was warm and savory, the salt stinging his tongue. Mhumhi was startled, and bared his teeth at the motion. Danai froze, fear crossing her features. Danai elected not to say anything to this, and just put all of her attention into cutting the meat into tiny places with some shiny metal things. Maha pulled her lips down and picked up one of the yellow things with her dirty fingers. She held some out in her hand and Mhumhi took it, lapping it up more than biting it, as it was so soft. It tasted as sweet as it smelled, and he wrinkled his lips a little. “It’s all right,” he said politely. Danai returned Maha’s plate, with the meat cut up into tiny chunks. Maha promptly fed a piece to Mhumhi, giggling when he licked her fingers. “Cut his up too,” she told Danai, tone haughty, and Danai took Mhumhi’s plate, looking a bit startled. The meat was tough and chewy, but not bad at all, thought Mhumhi. It gave off savory juices. He licked his lips and looked over expectantly at the piece Danai was cutting apart for him. “Have you ever turned into a hyena?” Maha asked. There was a moment of silence at the table. Danai had not stopped cutting, nor had her expression changed. Maha and Mhumhi both watched her, Mhumhi shifting to put his opposite paw on the table. 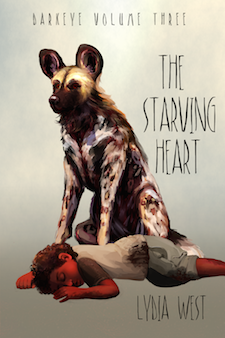 “She means human,” Mhumhi clarified, turning his head sideways to snap up a piece of meat. “Why shouldn’t it?” Maha demanded. Maha uttered a little gasp. Danai rubbed her forehead with one hand. “You thought we were animals, and that you’d kill us,” Mhumhi said flatly. Danai’s expression was pained, but Mhumhi slowly sat back down on his haunches. He had conveniently forgotten about the police and their means of dealing with hulkers. Mhumhi gazed at her, startled; he’d never heard anything like this come out of her mouth before. Danai looked physically pained. “Oh, yes,” said Danai, eyes flicking away nervously. “The hyena is her grandson?” said Mhumhi, putting his ears back. “You’d better explain it, then,” said Mhumhi, and he took another piece of meat. Danai made a face and scratched the side of her head very vigorously, as it this would somehow get her out of the situation, and then sighed. “That doesn’t make any sense at all,” said Maha. “But not the other way around,” said Mhumhi. “Why? Did you not like being a hyena?” asked Maha. And that would be why, Mhumhi thought, these hulkers were willing to put their hyena brothers and sisters in little cages. “Why don’t you just go up and get them?” asked Maha, but Mhumhi had figured it out. Danai gave him a vague smile, as if she thought he had made a joke in poor taste. “If the records-” began Mhumhi, but he was interrupted. The door at the far end of the cafeteria had sprung open. A hulker female entered, bearing a mass of bandages on one arm. In the other she held a leash attached to a hyena. The fur on Mhumhi’s back rose, for the hyena was not muzzled, and it locked eyes with him and giggled. The woman saw Mhumhi too and shrank back against the wall, but the hyena disconnected itself from her with a snap of fabric and ran directly at him and Maha, leash trailing. Mhumhi leapt down from the bench in front of her, baring his teeth and growling, as Maha screamed and clambered on top of the table. The hyena loped towards him, raising its hairy little tail and giving a squeal at the sight of his teeth. Mhumhi gave it a warning chatter as it stopped just a few feet short of him and whooped. “Vimbo!” shouted the bandaged woman. Danai ran around and picked up the hyena’s leash, saying words in hulker language. The hyena went with her as she tugged, though it kept looking back at Mhumhi, its jaws parted. Mhumhi suddenly recognized the pair- the hyena had been in the car with him the night before, cringing, and the woman was the one Kutta had bitten on the arm. His mistrust deepened. Pepukai said something to Danai, frowning, her eyes hard as she looked at Mhumhi. “She says she’s worried a brute like you would hurt Vimbo,” Maha translated from behind him. She had not gotten down off the table, and was now hugging her knees. Mhumhi wanted to laugh, but he held himself in check. However tame Danai might call the hyena, he could imagine the bloodlust lurking behind its dark eyes for Maha- he, too, had felt it. “Of course Mhumhi would not harm Vimbo, I’ve told her that,” said Danai, waving a hand. Mhumhi decided to keep mum on the topic for the moment. “What does she want?” he asked. Danai appeared not to hear him, for she was talking to Pepukai again. Mhumhi prowled back around and hopped up onto the table beside Maha. “I’m not nice,” Mhumhi protested. “No, no way, I don’t want her grandson to eat me!” She giggled, perhaps too loudly, because Danai glanced back at them. Mhumhi eyed Pepukai, who was clutching Vimbo’s leash tight against herself, for a moment. As if summoned, three more hulkers materialized into the room. Mhumhi recognized one as the younger hulker who had let him out of the bathroom; the others were broad-shouldered strangers. “Jabulile,” Danai said, frowning at the younger one, then seemed to snap herself out of it. She said something to the two others and they started coming forward. Mhumhi hesitated. Maha dug her fingers harder into his fur. Danai said something in the hulker tongue and she froze. “What, what did she say?” Mhumhi asked, alarmed, twisting to look at her face. Her eyes were wide. “Is that what she said to you?” asked Mhumhi, looking back at Maha. Her grip on him was slackening, and in a rush she pulled her arms away. She looked incredibly unhappy. Mhumhi was willing to bet that there was a great deal more to what Danai had said, but Maha was already getting off the table to leave, letting the two strangers flank her. One put a hand on her shoulder and Mhumhi saw the muscles in her back tensing. “I should go with her,” he said to Danai, feeling a bit of anger rise up. But Danai had walked over to him with something in her hands: the leash and collar. “I need you to come with me for just a moment,” she said.